Our vision for the future of Auburn Research cuts across department boundaries. We have examined the most pressing challenges both within the borders of Alabama and far beyond, from the environmental risks in the Northern Gulf of Mexico to security in our cyber world. We have analyzed Auburn’s existing strengths–great minds turning ideas into meaningful results in fields like biomedical imaging and STEM (science, technology, engineering and math) education. Based on this insight, we have focused strategically on clear research objectives in six interdisciplinary hubs. 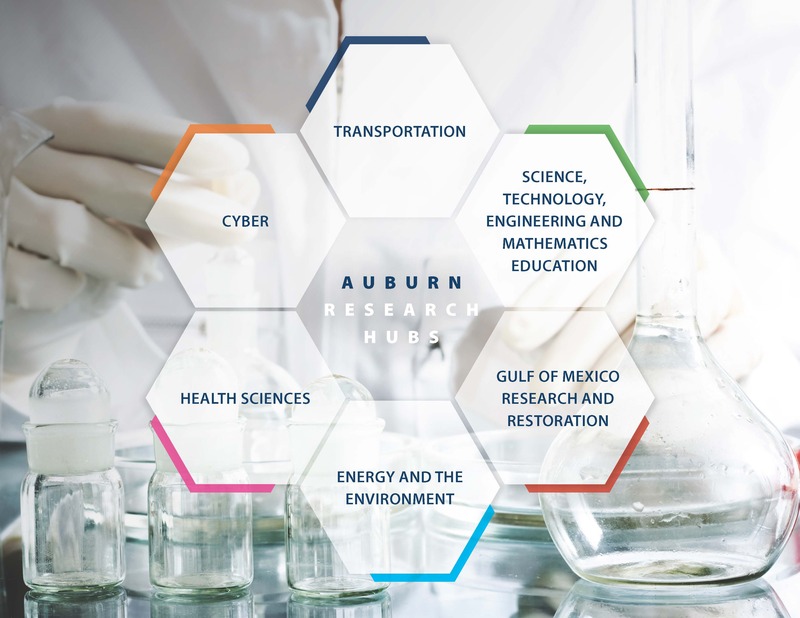 Auburn Research is bringing together seemingly disparate interests to harness our intellectual power and passion toward vital common goals like curing cancer, sustainably meeting our energy needs and defining the future of transportation. This is how Auburn Research will move us from the world we have now to the world we want tomorrow. By auburnresearch in Cyber, Energy and the Environment, Food Systems, Gulf of Mexico Research and Restoration, Health Sciences, STEM, Transportation on October 30, 2014 .